Every one gets tons of email these days. This includes emails about super duper offers from amazon to princess and wealthy businessmen trying to offer their money to you from some African country that you have never heard of. In all these emails in your inbox there lies one or two valuable emails either from your friends, bank alerts, work related stuff. 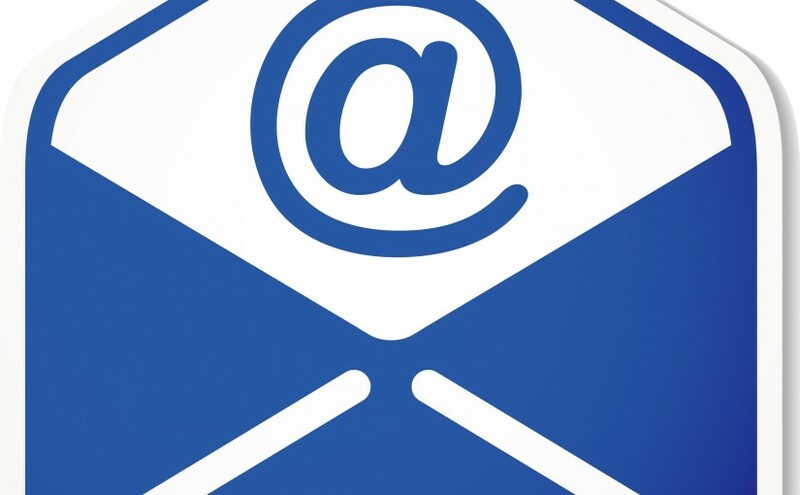 Spam is a problem that email service providers are battling for ages. There are a few opensource spam fighting tools available like SpamAssasin or SpamBayes. 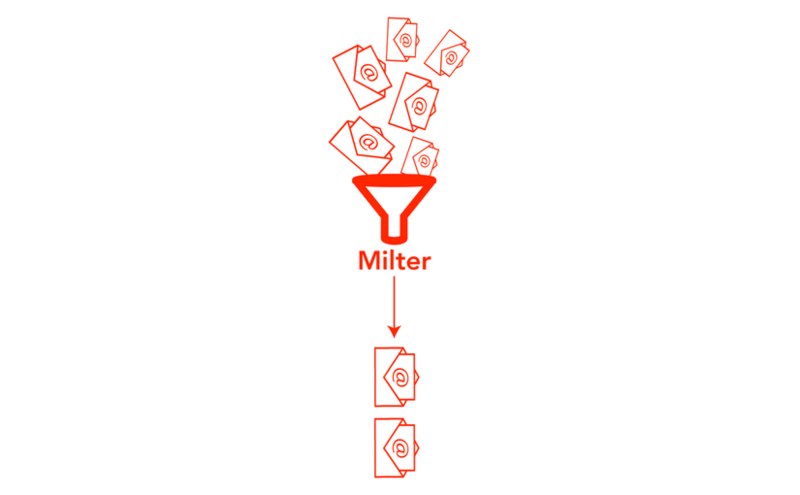 Simply put – milter is mail filtering technology. Its designed by sendmail project. Now available in other MTAs also. People historically used all kinds of solutions for filtering mails on servers using procmail or MTA specific methods. The current scene seems to be moving forward to sieve. But there is a huge difference between milter and sieve. Sieve comes in to picture when mail is already accepted by MTA and had been handed over to MDA. On the other hand milter springs into action in the mail receiving part of MTA. When a new connection is made by remote server to your MTA, your MTA will give you an opportunity to accept of reject the mail every step of the way from new connection, reception of each header, and reception of body. The above picture depicts simplified version of milter protocol working. Full details of milter protocol can be found here https://github.com/avar/sendmail-pmilter/blob/master/doc/milter-protocol.txt . Not only filtering; using milter, you can also modify message or change headers. HOW DO I GET STARTED WITH CODING MILTER PROGRAM ? WHY NOT SIEVE WHY MILTER ? I found sieve to be rather limited. It doesn’t offer too many options to implement complex logic. It was purposefully made like that. Also sieve starts at the end of mail reception process after mail is already accepted by MTA. Coding milter program in your favorite programming language gives you full power and allows you to implement complex , creative stuff. When writing milter programs take proper care to return a reply to MTA quickly. Don’t do long running tasks in milter program when the MTA is waiting for reply. This will have crazy side effects like remote parties submitting same mail multiple time filling up your inbox. Posted on October 19, 2017 April 30, 2018 Author godsonCategories linux, messaging, ProgrammingTags communication, email, linux, python, twistedLeave a comment on What is milter? Twisted features a decorator named inlineCallbacks which allows you to work with deferreds without writing callback functions. This is done by writing your code as generators, which yield deferreds instead of attaching callbacks. Instead of calling addCallback on the deferred returned by redis.Connection, we yield it. this causes Twisted to return the deferred‘s result to us. Though the inlineCallbacks looks like synchronous code, which blocks while waiting for the request to finish, each yield statement allows other code to run while waiting for the deferred being yielded to fire. inlineCallbacks become even more powerful when dealing with complex control flow and error handling. txredis is a non-blocking client for the redis database, written in Python. It uses twisted for the asynchronous communication with redis. hmset, set key to value within hash name for each corresponding key and value from the mapping dict. Above code do connection with redis-server. Here, define callback function onRedisConnect and errRedisConnect. Here, define callback function onSuccess and onFailur and log the appropriate result. How Implement Multiservice in Twisted. Multiservice module is service collection provided by twisted, which is useful for creating a new service and combines with two or more existing services. The major tools that manages Twisted application is a command line utility called twistd. twistd is a cross-platform, and is the recommended tool for running twisted applications. object. which represents your application. Application acts as a container of any “Services” that your application provides. This will be done through Services. Services manages application that can be started and stopped. In Application object can contain many services, or can even hierarchies of Services using “Multiservice” or your own custom IServiceCollection implementations. To use multiserivce, which implements IService. For this, import internet and service module. To run, Save above code in a file as serviceexample.tac . Here, “tac ” file is regular python file. Twisted application infrastructure, protocol implementations live in a module, services, using those protocols are registered in a Twisted Application Configuration(TAC) file and the reactor and configuration are managed by an external utility. Here, I use multiservice functionality from service. agentservice create object of multiservice. Then add services using add service method. In service, you can add web servers, FTP servers and SSH clients. After this, set application name and pass application to serviceparent method. To run serviceexample.tac file using twistd program, use command twistd -y serviceexample.tac -n. After this, open browser and enter url localhost:8082 and localhost:8083. You can see result on web page and both TCP servers are active. Posted on December 13, 2016 Author Deepen PatelCategories begginers, How To, networking, Programming, UncategorizedTags multiservice, python, twistedLeave a comment on How Implement Multiservice in Twisted. 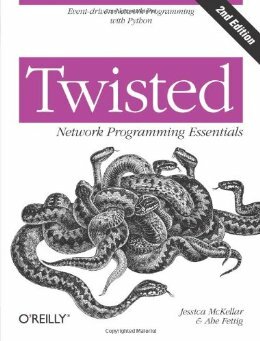 Twisted is an asynchronous networking framework. Other Database API Implementations have blocking interfaces. For this reason, twisted.enterprise.adbapi was created. It is a non-blocking interface,which allows you to access a number of different RDBMSes. General Method to access DB API. 1 ) Create a Connection with db. create a connection with db. 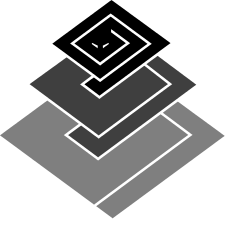 Cursor blocks to response in asynchronous framework. Those delays are unacceptable when using an asynchronous framework such as Twisted. Database Connection using adbapi API. Here, We do not need to import dbmodule directly. dbmodule.connect are passed as extra arguments to adbapi.ConnectionPool’s Constructor. Here, I used ‘%s’ paramstyle for mysql. if you use another database module, you need to use compatible paramstyle. for more, use DB-API specification. Twisted doesn’t attempt to offer any sort of magic parameter munging – runQuery(query,params,…) maps directly onto cursor.execute(query,params,…). This query returns Deferred, which allows arbitrary callbacks to be called upon completion (or failure). Demo : Select, Insert and Update query in Database. Test DB : This File do database connection and basic operation. # general purpose method to receive result from defer. Here, I have used MySQLdb api, agentdata as a database name, root as a user, 123456 as a password. Also, I have created select, insert and update query for select, insert and update operation respectively. runQuery method returns deferred. For this, add callback and error back to handle success and failure respectively. Recently I was faced with an issue where a long running process is listening on loop back IP (127.0.0.1) on port 8080 on one of our servers and client programs on other machines are trying to access it on server’s local IP 10.91.20.66. We ended up at this situation when we have updated server configuration and restarted the server program and forgot to change IP binding info in config file from loop back to local IP. Server got busy with it’s work, with lots of customer’s connections already, by the time we have discovered that some services of server are not accessible to client programs on other machines. So, the dummy’s guide to fixing it by changing config and restarting the server program is not an option as we can’t risk to disconnect existing customers. So, hot patching is the only option until we can restart the program at next scheduled down time. I could have fixed this in couple of ways either by adding few lines to iptables configuration or by writing simple socket program in python. The task is to forward data coming in on local IP port 8080 to loop back IP (127.0.0.1) port 8080 and send replies back to source address. Forwarding one socket data to other socket is pretty trivial using Python’s socket library and Twisted made it even more trivial, so I went with the following solution using Twisted. This simple program is made possible by the heavy lifting done by twisted library. Interested folks can look under hood at twisted’s portforward.py module. Refer following script.This script sends emails to given recipients asynchronously. Here we have used twisted.internet.defer.DeferredList API. This API is very useful in some scenarios. Suppose you have to finish multiple task asynchronously and then you have to finish one final task. For examples, your program is connected to 4 different clients & and before shutting it down, you have to make sure that all connections are closed properly. In such cases, DeferredList API is used. Create deferrands of each task & make their list. Pass this list to ‘DeferredList‘ API which will return you another deferrand. This final deferrand will be fired when all deferrands in list will be fired. In this tutorial, same email will be sent to multiple recipients using `twisted.internet.defer.DeferredList` API. For each recipient, one defer will be created and will be added in `DeferredList`. `DeferredList` API will be fired only when all deferrands in `DeferredList` will be fired. Though above script runs fine, there is one problem. Here, recipients number is very small. But suppose you have to send emails to millions recipients then will this code work ?. Refer function ‘send_multiple_emails’. Here we have used ‘for’ loop which is blocking. So until this ‘for’ loop is iterated, program will not move to next line of code. For 3 recipients iteration will not take much time however for millions of recipients, it will not work. So lets modify our code to work like generators. In this tutorial, same email will be sent to multiple recipients using `twisted.internet.task` API. Each email recipient will be yielded using `twisted.internet.task.coiterate` API. Here, we have used twisted.internet.task.coiterate API. This API iterates over iterator by dividing reactor runtime between all iterators. Thus we can send millions of emails asynchronously. It is very easy to send emails using ‘smtplib‘ module of python. Check following recipe. But ‘smtplib’ module sends emails synchronously. So code execution is blocked until email is sent. To overcome this, lets try to send email asynchornously. For this tutorial we are going to use Twisted framework. Twisted is event-driven networking engine. It uses reactor-pattern. Twisted uses deferred objects to address waiting IOs. Deferred is more like subset of promises. Check following recipe to send asynchronously MIME message using Twisted. How to implement Websocket server using Twisted. 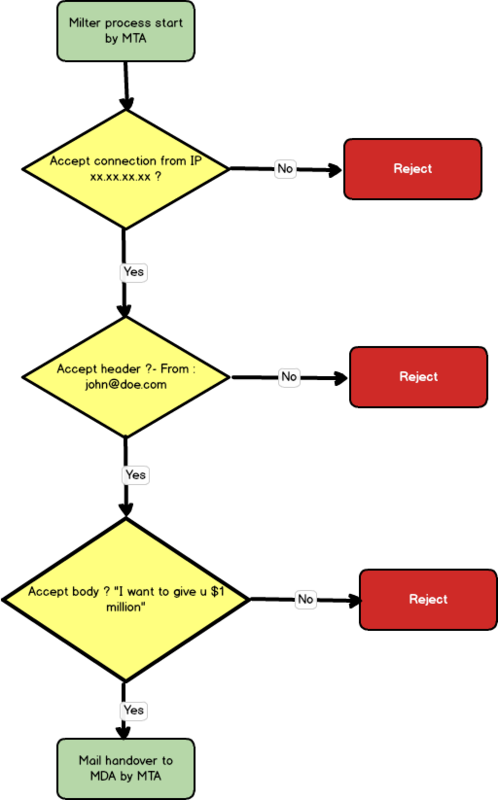 HTTP is a request-response type one way protocol. For the web application where continuous data is to be send, websocket was introduced. Unlike HTTP, websocket provides full duplex communication. Websocket, which can be said as an upgraded version of HTTP, is standardized to be used over TCP like HTTP. In this article I will share my experience in implementing websocket with twisted, a framework of python for internet. If you are familiar with websocket, then you can skip to twisted.web or else below is a little introduction to websocket. In response, server will send 101 Switching Protocols code and Sec-WebSocket-Accept whose value is calculated using Sec-WebSocket-Key. you can find more information here. After a successful handshake, any of the peer can send data to each other which must be encoded in binary format described in websocket RFC. A high-level overview of the framing is given in the following figure. As in normal twisted.web server , at TCP level, we have HTTPChannel class (a child class of T.I.protocol.Protocol) and server.Site class (which is the child class of T.I.protocol.ServerFactory). Also a Resource instance needs to be passed to server.site class, so that it can serve GET request. Whenever a data is received, DataReceived method of HTTPChannel is invoked. Now if data starts with ‘GET’, allow the HTTPChannel handle it, which will invoke the render function of the root resource provided to Site class. Render will set 101 response code and will compute the websocket response key. During handshake do not send any raw data, because if handshake is successful this will be considered as framed binary data. Even if you want to send, frame it and send. If data doesn’t start with ‘GET’, that means we can assume it is a binary encoded message. Now this message can be decoded using Frame.py, which is a very simple data framing module following WebSocket specification. Data send to the client by server should be unmasked as per the websocket specification. Below is code example of an echo websocket server. # decoding Data using Frame module wrote by Morgan Philips. # Sending back the received message. Posted on November 25, 2015 December 7, 2016 Author Sumeet PCategories How ToTags how to, python, twisted, websocketLeave a comment on How to implement Websocket server using Twisted.